The story of Spain’s economic, social and political crisis is one about property, need and value. And at the heart of that story lies a question that is familiar to the point of cliché: what makes a house a home? It may sound trivial, but in a country where families are sleeping in the street, entire building blocks are devoid of residents and housing remains out of reach for major swathes of the population (despite the ubiquity of “For Sale” signs in the urban landscape), it is a question that remains largely unanswered by policy-makers. For over four years, the Plataforma de Afectados por la Hipoteca (PAH or “Mortgage Victims’ Platform”, in English) have pursued a simple and poetic response to this question: people living together, for one another. Their campaign for mutual aid, solidarity and civil disobedience strike at the very core of Spain’s power structure, and despite an often overwhelming institutional blockade, have received the support of up to 90% of the population. For insight into the PAH’s spectacular support, radically transformative praxis and the institutional challenges they face, I recently spoke with Elvi Mármol, a PAH activist from the city of Sabadell, just north of Barcelona. Though she worked for several years as an accountant, today she is a self-employed sales representative. This, she says, gives her a considerable amount of time to dedicate to the PAH. She is a member of PAH Sabadell’s Cases Committee and the community manager for their social networks, as well as a member of the Collective Bargaining and International Committees for PAH Catalonia. How did you come to join the PAH? Elvi Mármol (EM): Like many people, I arrived at the PAH midway through 2011 through the 15M movement. I wasn’t a part of the 15M movement in my city, but I received a pamphlet promoting a talk by the PAH at the plaza in front of city hall. Until then, I had only heard of the movement through the media and didn’t know that it was present in Sabadell, so I jumped at the chance and went to the talk. I knew that my knowledge of financial products and my experience in fiscal consultancy and bank negotiations would be helpful, so I got to work right away. I was able to contribute, but what I didn’t know was how much the PAH would help me—it’s so much that we’d have to do another interview. What spurred the creation of the PAH? In 2006, the “V de Vivienda” movement (a reference to V for Vendetta that translates to “V for Housing”) was born in Barcelona. For two years, they articulated the struggle for the right to decent housing and denounced the housing bubble, calling for an end to the violence of real estate speculation. When the bubble burst two years later, some of that group’s activists realized that people were going to stop being able to pay their mortgages, and that the struggle would no longer be about access to housing but that many families would actually be left without a home. They also discovered that Spanish mortgage law would leave them with a debt hanging over their heads for the rest of their lives. 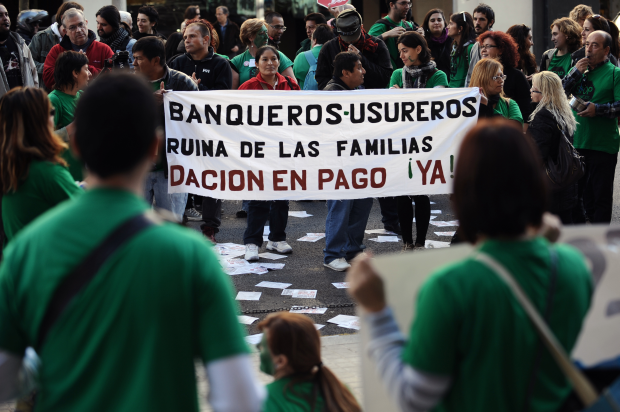 So in February of 2009, the Plataforma de Afectados por la Hipoteca (PAH) was born, which put the failure of housing policies on the agenda and would prove a major blow to the administrations that had pushed the population to become indebted. What's the relationship between 15M and the PAH? EM: The PAH was formed two years before the 15M movement burst onto the scene; there were already groups in Barcelona, Sabadell, Terrassa, Murcia and other cities. The 15M movement in the plazas, then later in the neighbourhood assemblies, helped launch PAHs all over Spain. Now there are over 200 PAH groups. And the 15M movement was especially helpful to the Stop Evictions campaign: we went from being 50 or so at the evictions to being hundreds. What is everyday city life like in Spain right now? EM: Right now, daily life in Spain is rough and getting rougher. 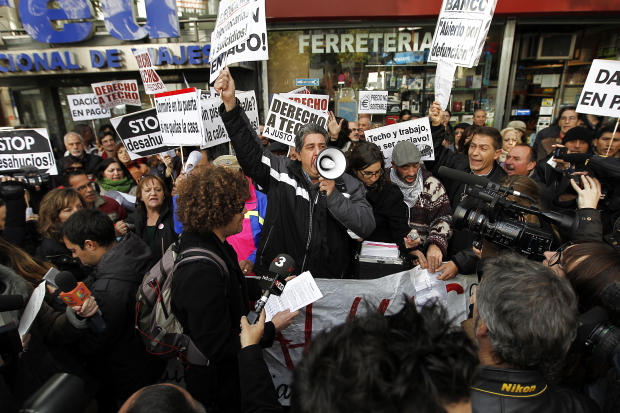 The right to decent housing is systematically violated in Spain. There are over four million empty houses, evictions are still rampant, public housing is about 1% of total housing and news reports are saying that even that will be privatised. 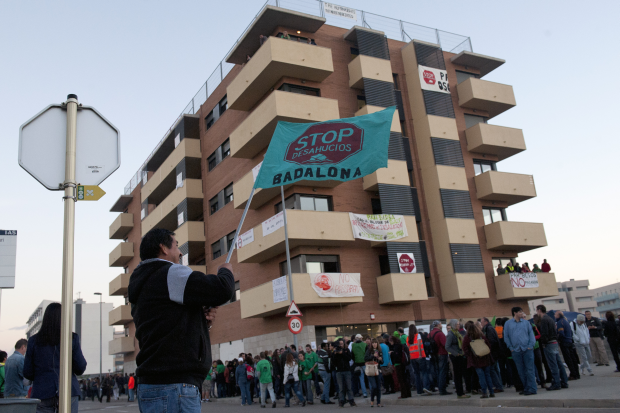 Just a few months ago, the City of Madrid sold 3000 subsidized homes to Goldman Sachs. The unemployment rate is still at record highs, nearly 28%. It’s over 50% for youth, so they will not be able to leave their homes and will have to be maintained by their families until they’re in their thirties. Cuts in education are making it more difficult for young people to go to university and cuts to health services are already leaving thousands of people excluded from the Spanish public health system. Why is the struggle for decent housing, and in particlur the PAH’s no-evictions campaign, such an important struggle, as opposed to labour, public services or other social issues? EM: Before a person loses their home, it’s pretty likely that they have lost their job or main source of income. The last thing anyone thinks of losing is their home, the roof over their head, the place where they feel secure and which any person needs, whether it was a cave thousands of years ago or the various types that exist in our current consumerist era. It is within this basic need that the basic struggle for decent housing exists. In the struggles you mention, it is a bit more difficult to achieve such important and tangible victories in so little time. This makes those struggles seem utopian to people who are less politicised. We must find a way to take advantage of the opportunity the PAH offers us to make the struggle grow in other areas, in a way that is more global and more united. What is the relationship between the PAH and party politics? Do you see the PAH as being in direct opposition to party politics? What is the relationship between the PAH and the police? EM: The relationship with Spain’s various police forces changes according to each city. In Sabadell, the Catalan Mossos d’Esquadra have been the protagonists in a number of horrific episodes. A couple of years ago, after an action on Three Kings’ Day in which we went from bank to bank leaving bags of charcoal, they confronted a number of activists and injured a minor. Just a few months ago, when we occupied a large building block to relocate some evicted families, they wanted to break through the 200 people blocking the doorway. One of our lawyers told the unit that they could not enter without a warrant and the next day the Mossos accused her and two activists of resistance. Of course, the judge later absolved them of those charges. Very soon, the government will enact their reform of the penal code and although we know that what they have presented is not the definitive version, it is very clear that the changes are intended to impede our protests. For example, blocking an eviction or carrying out an “escrache” (where we single out politicians who are against reforming the Spanish mortgage law in favour of people) can be fined anywhere between €1.000 and €30.000. Assisting migrants with expired residence permits will be criminalised. Passive resistance to an officer’s aggressions can be treated as “threatening authority”, which can be penalised with two to four years of prison. These measures will be extremely tough and will certainly punish solidarity and working class people. What kind of tactics and strategies do the PAH engage in and why? Do you see your tactics as part of longer-term politics? EM: I think that getting banks to declare mortgages as non-recourse debts, stopping evictions and obtaining reduced rent through social housing are some of the small victories that have made us strong and differentiate us from other social movements today. I would say that our tactics and strategies are mostly short-term and consist of establishing goals that are attainable in terms of their timeframe and the energy they require. These short-term, tangible successes lead people to go from being dejected and demoralized to being empowered and making an impact in their communities, in relatively little time. They also help us keep the movement visible, reach more people and continue to question politicians and bankers about changing the law. At the same time, our assemblies assure that we are always learning from and training one another, so that we never lose the essence of what makes the PAH so important, which is the people who participate in the movement. Without a doubt, the PAH’s greatest success has been to empower people. These are men and women who at one point were sold on the idea that they were part of a middle class, and now realise that they are part of a much larger majority, which is the working class. One day they were just a number in the labour force and now, thanks to the PAH, they are activists who not only defend the right to decent housing but work with militants they have met from other movements to weave the social fabric of their own communities. What have been the keys to success of the movement so far? EM: The PAH’s success lies in every one of its local assemblies. People arrive at those assemblies looking for a solution to their individual situation, but they quickly realise that through solidarity and civil disobedience, not only can they find solutions to their problems, but also that they are part of a community that is capable of large scale success. The PAH today is Spain’s most important social movement, but it’s neither perfect nor a panacea to all of the country’s ills. We do a lot of things that were being done many years before, in the neighbourhood movements, the squatters’ movements and so on. The platform was born at the right place at the right time, and it has understood how to learn, grow and expand without losing its essence. Perhaps with time, we will be able to bring together all of the different social struggles taking place at this moment in history.